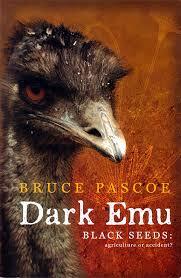 Bruce Pascoe: Dark Emu, Black Seeds: Agriculture or Accident? As a general principle we support foreign investment. Always have and always will. Our country is unimaginable without foreign investment. I guess our country owes its existence to a form of foreign investment by the British government in the then unsettled or, um, scarcely settled, Great South Land. There is a particular argument that could be posed about the word ‘settled’ in relation to the law of colonies, but Abbott here was talking economies, not law. You can almost hear the wheels turning in his brain as he thinks “oops- not ‘unsettled’ because I suppose that they were there, I guess-‘ scarcely settled’- that’ll do”. Bruce Pascoe has a Bunurong/Tasmanian indigenous heritage, and if you watched First Footprints, (my review here) you will recognize him as one of the talking heads on that wonderful, paradigm-rattling documentary. He is not an academic historian as such, and described himself in his earlier book Convincing Ground (2007) as a “mug historian with no training” (p. 200). His interweaving of personal, current day narrative with historical analysis, in both this and his earlier book, places his work in that uneasy space between local history and academic material. His methodology was to return to the diaries of the early white explorers, surveyors, pastoralists and protectors. These men (for they were overwhelmingly male) espoused the racial superiority of white settlement, decried the primitivism of Aboriginal culture and predicted the inevitable extinction of Aboriginal ‘nomads’. Yet at the same time, they described large structures capable of sheltering thirty or forty people, stockpiles of ground seed and grain, dams and redirections of water courses, fish traps, and storehouses. They were unconscious wreckers (or at least one hopes they were unconscious): eating the grain that had been carefully piled up waiting for consumption at a later date, gladly taking advantage of a clay-daubed shelter, or rather more ominously, testing the strength of the roof of a shelter by riding over it. It strikes me as deeply ironic that explorers, starving, blinded and maddened by bites and sun, could look at aboriginal people serenely co-existing with the environment, and then write about them as ‘primitive’. He finds example after example in the words of explorers Major Mitchell, Sturt and Howitt, early colonists Isaac Batey, James Dawson, and protectors and missionaries George Augustus Robinson and Joseph Orton . He reproduces some of their sketches that, when you extract them out from the scrawled text that surrounds them, demonstrate much more deliberation and ingenuity on the part of the constructors, than the 19th century authors’ commentaries convey. Mitchell talked in sorrow about the demise of Aboriginal Australia… but despite this compassion Mitchell writes, a mere two paragraphs later, ‘We again (on the Hunter) find some soil fit for cultivation, and the whole of it taken up by farms’… At one moment he expresses sorrow for the losses of the Aboriginal population but within a page he’s extolling the value of the lands forcibly taken from them. On his previous explorations Mitchell has seen the use Aboriginal people made of their lands, although some of the food production techniques were too discreet to capture his attention or understanding, but then opines mildly about the future of Australian farming as if Aboriginal food production had never existed. He looks down the valley at the sheds and houses of the settlers where smoke dwindles from the chimney and squares of amber light glow at windows and revels in the domesticity. Only a year before he was envying the warmth and domesticity of the Aboriginal village, but now he prides himself on opening up this land to to his own race. Pascoe draws also from the work of anthropologists, well known ones like Stanner and Rhys Jones, but also some maverick ones who are challenging established understandings. There are a number of places in the book where you sense Pascoe sitting in on conversations, listening carefully to the debates, and weaving in their work into his argument. Some of the texts he draws upon are small productions, well outside the mainstream, like a small saddlestitched 70 page book produced by Peter Dargin for the Brewarrina Historical Society, or a similar book by Rupert Gerritsen, published in London for want of Australian interest, and No. 35 on a Google search into ‘Australian Aboriginal Grain Crops.’ He does his own work no favours by including (albeit with misgivings) wild estimates of Aboriginal occupation of Australia going back 120,000, alongside other figures of between 40,00 -65,000 years. Nor does he burnish his own reputation by citing Gavin Menzies’ 1421: The Year China Discovered the World, a book largely dismissed by academic historians. The book has eight chapters. In the first, ‘Agriculture’, he focuses on the yam and grain harvesting, irrigation, and the harvesting of emu and kangaroo. Chapter 2, ‘Aquaculture’ examines fishing operations, particularly in Brewarrina and Lake Condah, and watercraft on the rivers and seaboard. Chapter 3 is titled ‘Population and Housing’, where he argues that villages marked the movement towards agricultural reliance, most particularly where there were stone constructions. Chapter 4 ‘Storage and Preservation’ explores the use of pottery and stockpiling , while Chapter 5 examines ‘Fire’ in the creation of grasslands. Chapter 6 is a divergence into ‘The Heavens, Language and the Law’ where he explores the theories that posit a qualitative shift in the ‘intensification’ of food production and technology about 4000-5000 years ago. This chapter is largely the representation of other people’s theories, which he views rather sceptically. I found this chapter rather hard to follow, although it seemed to resolve into an examination of concepts of land ownership, and what he called “jigsawed mutualism” whereby people had responsibilities for particular parts of the jigsaw, but could only operate that part so that it added, rather than detracted, from the pieces of their neighbour (p. 138). Ch. 7 ‘Australian agricultural revolution’ is only four pages in length and suggests several Aboriginal crops that could be farmed commercially in the future. The final chapter ‘Accepting History and Creating the Future’ is a plea for an acceptance and re-visioning of Aboriginal agricultural and spiritual achievement, and allowing this to inform the future. It is perhaps unfair to review a book by making reference to another author’s work, but in this case it is almost unavoidable. Bill Gammage’s The Biggest Estate on Earth was published prior to Pascoe’s work, and indeed Pascoe cites him in several places. A beautifully crafted and lushly produced book, Gammage’s work has been debated within academia and received the Prime Ministers Prize for Australian History in 2012. The two books, although mismatched in production values and ‘clout’, cover similar material and arguments. However, having only just flipped through Gammage’s book, it seems that he speaks more of land management, with a particular emphasis on fire. Pascoe’s much smaller and more modest book, on the other hand, concentrates rather more on economic and social systems, with rather more emphasis on interventions in settled places as a challenge to the ‘hunter-gatherer’ image. A challenge, too, to a Prime Minister who sees the land as “unsettled- um- scarcely settled”. Posted as part of Lisa’s ANZLitLovers Indigenous Literature Week. Yvonne Perkins has reviewed it as well. This review is an excellent riposte to a PM – was it ignorance or a deliberate insult to our indigenous people during NAIDOC week? Thanks too for supporting Indigenous Literature Week, it means a great deal to me.